The national dish of Cuba: tender shredded beef stewed with peppers, tomatoes and delicious spices. Traditionally served with rice, black beans and fried plantains. Season meat on both sides with 1 teaspoon salt and several grinds of black pepper. Heat oil in a heavy (preferably cast iron) skillet. Brown meat over high heat for 3 minutes per side. Transfer to the bowl of a slow cooker. Toss in the sliced carrot. Add a tablespoon of oil to the skillet along with the garlic, onions and peppers. Turn the heat down to medium. Cook for 6-7 minutes until the vegetables are softened and starting to caramelize, stirring constantly for the first minute, to make sure the garlic doesn’t brown. Add wine and simmer for a minute, stirring and scraping the browned bits from the pan. Transfer the mixture to the slow cooker. In a medium bowl whisk tomato puree, tomato paste, broth, dried spices and 2 teaspoons salt. Pour over meat. Cook on high for 6 hours. After 5 1/2 hours remove the meat. Shred it by pulling it apart using two forks. Return it to the slow cooker. Stir in olives and vinegar. Continue to cook for 30 minutes more. 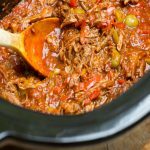 Serve ropa vieja with a sprinkle of chopped cilantro and lime wedges on the side. Traditional accompaniments are white rice and black beans.